Is New York Mets pitcher Steven Matz Jewish? It was a question fans were asking themselves last season during the team’s run to the World Series. Despite his surname, which is a syllable away from the word for unleavened Passover bread, the answer is no. But it turns out Matz gets the question all the time. So much so that when he met a fellow Matz — Jewish ESPN reporter Eddie Matz, no relation — the first thing he did was pop the question, according to the article that occasioned the meeting, published Wednesday. Matz the reporter wrote that the only time he’d ever encountered Matzes in the past was at family seders. Why, he asked Matz the pitcher, who helped power the Mets’ 2015 playoff run as a rookie, do you think you get the question so often? “Because I’m from Long Island and it sounds like Katz,” Steven Matz said of his last name. 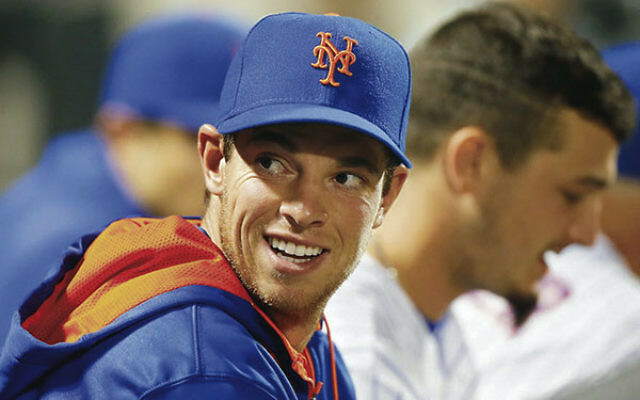 Jewish or not, Matz has New Yorkers kvelling. In eight starts this season, he has a 7-1 record, a stellar 2.36 earned run average and 50 strikeouts. He was born in Stony Brook, New York, and went to high school in East Setauket on Long Island’s North Shore-area.